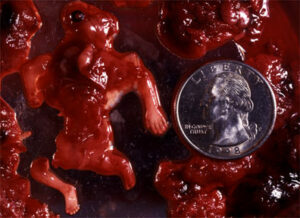 What Does Abortion Look Like? Remember this when you support or talk to those pro-choice legislators and presidents. Remember this when we choose to do nothing to defend innocent human life. What will God say at the great judgment if we remain silent in view of this holocaust! Shame on our new president! Shame on the Supreme Court! Forgive us Father for we know not what we do! God have mercy on us all. I am a sidewalk counselor, and my heart breaks seeing all the mothers and fathers going into the clinic to murder their children….and most of them know it’s wrong! We did have a turnaround a couple of months ago, and I just found out that the mother will be giving birth to her little boy mid-to late August! Praise God!!! 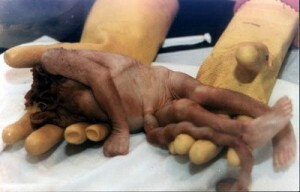 It’s amazing to me how abortion doctors can do that sort of thing day in and day out. It’s a total lack of conscience. I just about fight back tears just looking at the pictures. These doctors and nurses and those who are getting the abortions need our prayers. It is murder, period, as the nazis did before them, they first stripped the jews of any human dignity and branded them as “subhumans” and parasites then follows the genocide…history is repeating itself and the only “skin” difference is…being done in the name of free-choice. My 3rd daughter was born smaller than the third picture…she had no third trimester. She’s 2 now, and doing well. 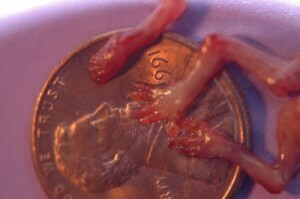 I FEEL SO SORRY FOR THOSE BABIES.IF I WERE THE PRESIDANT I WOULD NOT ALLOW ABORSHION!! !